A campaign has been launched to place a "commemorative bench" in the north London park as a tribute to the star. Fans of George Michael are campaigning to have a tribute bench made in Hampstead Heath for the late icon. A petition was set up on Change.org in the hopes of getting the City of London council to grant permission for a "commemorative bench" in the North London park, which would have been local to the star. 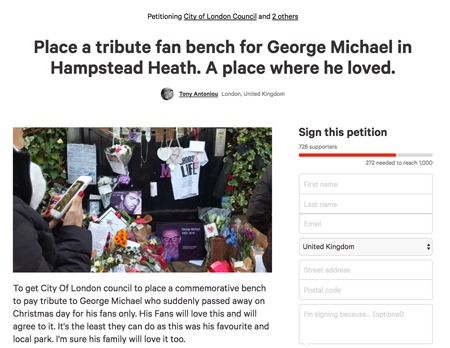 The petition, which was set up by huge fan Tony Antoniou and has over 700 signatures, reads: "George Michael loved Hampstead Heath park so much. It was his favourite park and he would often go there for some time to himself. "I now want to pay further tribute to George Michael with your kind support." The Wham! singer - who was born in East Finchley - had strong roots with the North London area. The Freedom singer also appeared with Ricky Gervais on the Extras Christmas special, where he made a joke about cottaging and being on community service.